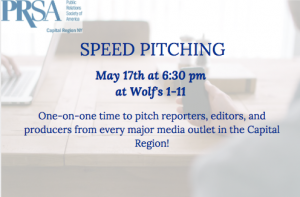 Join us for the PRSA Capital Region’s 7th Annual Media Speed Pitching Event! On May 17th at 6:30 pm at Wolf’s 1-11, will be hosting our most popular event of the year. Participants receive one-on-one time to pitch reporters, editors, and producers from every major media outlet in the Capital Region. This is your chance to tell the media about your organization, upcoming events, and issues in a fast-paced, high-energy environment. Participants will get 3 minutes to speak with each journalist, so make your pitches short and snappy! Make sure to register early to reserve your seat. Those who register first get to pitch first. Admission is $25 for PRSA and AMA members and $35 for nonmembers. Networking-only Rates (No Speed Pitching) are $25 fro PRSA members and $35 for Non-members. Due to time constraints, we limit registration to the first 40 people, and priority is given to PRSA members, so sign up early to ensure a space.